Growing up in Brooklyn we always frequented so called Mom and Pop shops, but never could I have imagined the explosion of the food scene in Brooklyn today. Going on Urban Oyster’s Brownstone Neighborhood Eats Tour was more than just sampling food, but a cultural look at a neighborhood, and an up close “taste” of the artisanal movement happening throughout the borough. Evolution: For a friend’s birthday, rather than go out to lunch or dinner, 4 of us decided to take a food tour to celebrate her big day. It’s a really good idea for a date, a parent-teenager activity, or when you have visitors from out of town. Even if you’re a New Yorker, you can learn something new while discovering a neighborhood you might not know well. Coffee: Arrive a little earlier than the 11am start time to grab a coffee at Blue Bottle a few short blocks from the meeting point of Stinky Brooklyn. Stinky Start: You just have to love a cheese store that embraces what some may say is cheese’s most unloved trait. The owner, Michelle Pravda, entertained us with stories of the evolution of Stinky, and her other Cobble Hill babies —Smith and Vine and Jakewalk, which she co-owns with her husband. The eating began right away with a sandwich featuring Stinky’s standout spicy pimento cheese spread alongside a handcrafted beer. As much of the neighborhood already knows the cheese was a big hit, and everyone returned at the end of the tour to bring some home. Stinky is a specialty shop also selling cured meats, gourmet products and craft beers. Guide: I could tell from the first few minutes that Anna was one of those special tour guides who love what they do, and convey it with so much enthusiasm its contagious. It’s hard to not have a good time exploring with Anna. She kept our group, made up of people from as far away as Chile, France and Kansas moving and entertained. On the Move: We traveled a square radius of blocks mostly in the leafy, brownstoned streets of Cobble Hill while crossing the borders into neighboring Carroll Gardens and onto Atlantic Avenue, which is the beginning of Brooklyn Heights. Stops at D'Amico Coffee Roasters, One Girl Cookies, 61 Local, Ted and Honey and Bien Cuit were tasty glimpses from true artisan shops where the focus is the ingredients and where they’re sourced. The miche bread at Bien Cuit, the result of a slow fermentation process may have been one of the best breads I have ever had. 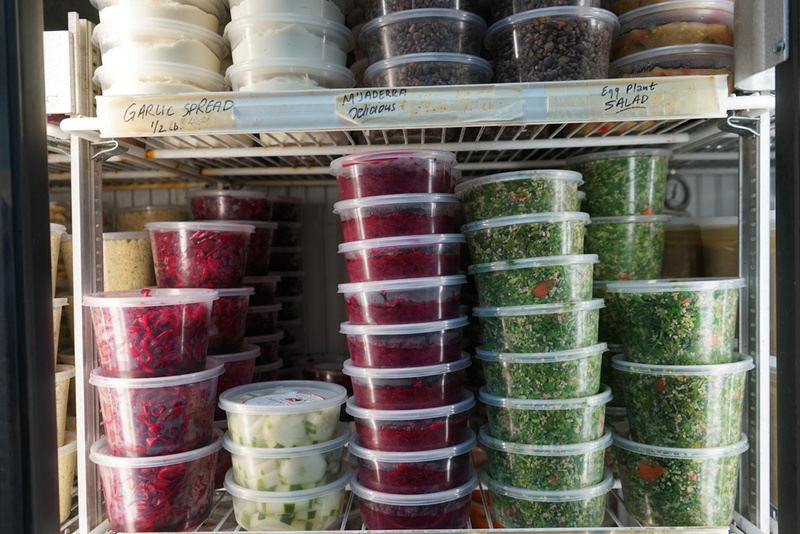 Middle East: I’ve been going to one of our stops—Damascus Bakery—for years for the very best hummus, freshly baked pita breads and spinach pies. Two doors down is Sahadi’s (not on the tour) another neighborhood staple. This old school specialty shop is where you can stock up on bulk goods and prepared foods. Make sure to buy some jugs of Saifan, their Lebanese olive oil that is delicious and extremely well priced. Last Stop: After enjoying Ted and Honey’s “bite” in lovely Cobble Hill Park, we headed to what was my favorite stop of the day—Brooklyn Farmacy and Soda Fountain for an old fashioned egg cream. Housed in a 1920’s apothecary and oozing atmosphere, sit at a stool at the counter and order one of their specialty sundaes. Dinner: Spend the day, there are many great small boutique stores to wander in and out of and have an early dinner at the excellent La Vara. This Clinton Street charmer has won deserving praise for its food, a mix of Moorish and Sephardic influences. At a recent brunch, in addition to filling up on the addictive fried chickpeas, we had the best Bloody Mary’s which we made the bartender reveal was made with a puree or freshly roasted red peppers. Copying that one soon! Impressions: It was a fun day visiting getting to know this charming section of Brooklyn. We loved hearing the stories of the neighborhood and the history of the shops we visited, all while gaining insight into the philosophy of running a small business. Warning: There was just too much bread, two sandwiches, a spinach pie, and bread samples at Bien Cuit. We were all craving something green by the end of the tour! If you avoid gluten this is not the tour for you!